I’m not a crafty person but I am a practical person so I love super easy DIY projects that can be fun. 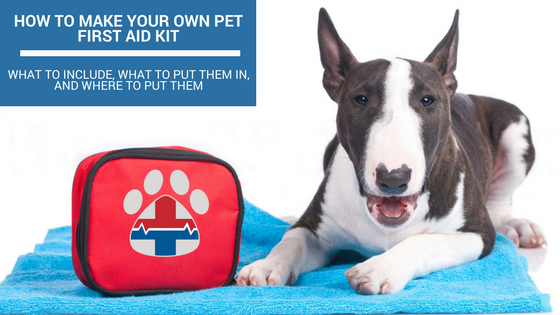 One of those such projects I found easy and rewarding was that of building pet first aid kits. You might think that sounds excessive but I have dogs come running in from the backyard with an injury while my husband wasn’t home and I didn’t have time to wait until I ran down to the basement to stop the bleeding. The numbers and even addresses of two close emergency veterinary hospitals along with the poison control hotline number are super important. I actually have these stored in my phone in the contacts section under “ER vet” so I can find them easily. In the contacts section on my iPhone there is a notes section, here I have a credit card number stored cryptically (I have switched up numbers in a pattern my husband and I know) so that I have that readily available in an emergency. Poison control needs you to pay before they can provide life-saving information so you will need credit card information. Also if I am in a rush to get my pet to the ER vet during an emergency I might not have my wallet, but I will always have credit card information available as it is stored in the cloud even if I forget my phone. Pro Tip: When traveling, search for the closest 24/7 ER vet hospital to where you will be staying. Store their location and contact number in your phone in a location that does not require Internet in case you don’t have it and even consider writing it down on paper. I have found small bags with lots of compartments to be great for travel first aid kits – those that you would put in your car. For example, a toiletry bag makes a great first aid kit container. For around the house though, a Tupperware container works just as well, especially when I need to reach in one-handed and fish around for gauze pads while the other hand is preventing my cat from running away with her bleeding paw! As I listed previously, I have first aid containers all over the place. I have them in each car and on each floor of my house. Many supplies come in multiples so this is quite cost-effective. You only need a few gauze pads or capsules of Benadryl in each, most are sold in large quantities. Things expire, ESPECIALLY when kept in the less-than-ideal climate of a car. The freezing temps and extreme heat will break down latex, medicines and even hydrogen peroxide. I freshen my kit every season and have a small light-block bottle for the peroxide. I get a large container of hydrogen peroxide for less than a dollar so I see no issue dumping out the small bottles I fill and replacing them with fresh active peroxide. Benadryl will expire and I usually plug the date it does into my Google calendar with a reminder. I also have a permanent reminder every January 1st to check all 1st aid kits for supplies and expiration dates. This is also the same day I change the batteries in my home smoke detectors. 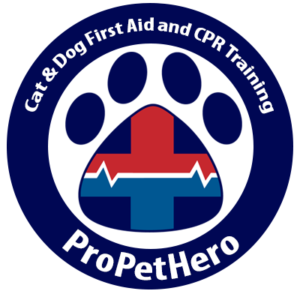 Most importantly, have the items on hand that you would need to provide essential first aid care for your pets. Know how to use all of these items as well as perform pet CPR by learning from our emergency veterinarian. Better to have the knowledge and not have to use it than not have the knowledge but need to use it. well said. have you any course about Pet Health?